Leptospirosis is an infectious, tropical disease. Often called "rat disease" or "swineherd's disease", it's a zoonosis, as it's transmitted from animals to humans. It is not compulsory to report it, and the incidence is probably underestimated. 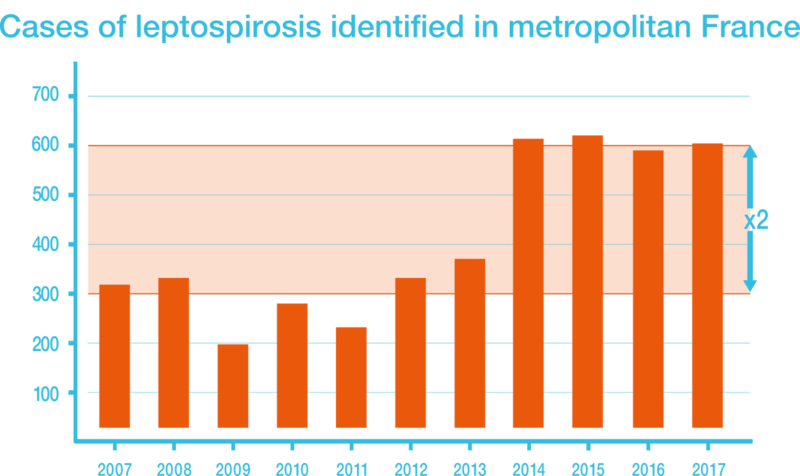 Leptospirosis is a potentially serious infectious disease caused by a bacterium from the Spirochete family (Leptospira, Treponema, Borrelia, Lyme disease and Syphilis): Leptospira. Rodents are the primary carriers of Leptospira Icterohaemorrhagiae, and are healthy carriers. This is why leptospirosis is often called "rat disease". In the host organism, Leptospira multiply and spread through the blood to different organs, such as the liver, lungs, or kidneys. The bacteria in the kidneys are eliminated to the natural environment via the urine, thus contaminating the soil and waterways. How is leptospirosis contracted ? Leptospira can penetrate through wounds, mucous membrane (ocular, oral, nasal, etc. ), or even through healthy, macerated skin. After an incubation period of seven to 12 days, or even a month, clinical expression manifests via an influenza-like syndrome, with possible meningeal symptoms, which can suggest several diseases. (2) It is thus difficult to diagnose this disease. Serious cases develop into potentially fatal multiple-organ failure, characterised by kidney failure, internal bleeding and jaundice, all of which can lead to hospital admission in the intensive care unit. (1, 10) For this reason, it's important to look for at-risk activities, to guide diagnosis as quickly as possible, and offer effective treatment before the effects intensify. The general population is exposed to risk when swimming or during freshwater-based leisure activities such as rafting, canyoning, triathlon, fishing, hunting, trapping etc. How to protect against leptospirosis? Prevention in a professional setting is a significant issue. · Vaccinate exposed subjects. Use should be based on official recommendations. Ask your doctor for advice. · Wash your hands with soap and water after freshwater-based leisure or sporting activities. · If you regularly practice activities with a risk of leptospirosis, consult your doctor, who will follow the official recommendations for the general population. The employer has a duty of care to employees, which means they must ensure safety, and protect the physical and mental well-being of employees, in accordance with article L4121-1 of the Labour Code. Up to five years' imprisonment (18) and a fine for the management team in the event of negligence, failed duty of care, or inexcusable conduct causing injury to an employee. Even in the absence of illness, some companies have been convicted for not taking sufficient measures to protect employees potentially at risk of leptospirosis. In recent years, at least a half-dozen cases that have come before tribunals ended in compensation payments of up to €23,000. (19) The plaintiffs had not necessarily contracted the disease. for periodic medical consultations which must be scheduled at most every five years, and should be adjusted as needed (implementation of vaccination schedule, for example). (5) S.Tubiana, «Risk Factors and Predictors of Severe Leptospirosis in New Caledonia» PLoS Negl Trop Dis. 2013 Jan; 7(1): e1991. (6) P. Hochedez, «Factors Associated with Severe Leptospirosis», Martinique 2010–2013», Emerg Infect Dis. 2015 Dec; 21(12): 2221-2224. (7) Herrmann-Storck C. ar al. Severe Leptospirosis in Hospitalized Patients, Guadeloupe. (13) Baranton G, Postic D Centre National de Référence des leptospires, Institut Pasteur Paris, Synthèse La leptospirose en France de 2001 à 2003 : 1-8. (14) Watrin M. Étude descriptive des cas de leptospirose diagnostiqués en Normandie sur la période 2010-2014. Saint-Maurice : Institut de veille sanitaire ; 2016: 1-28. - IT tools are used by the marketing department to manage prescribers of product(s) commercialized by IMAXIO. - The recorded information is reserved for the use of the relevant department and can only be disclosed to medical représentatives. - In accordance with the articles 39 and the following of the law n°78-17 of the 6th of January 1978 amended in 2004 relating to data, files and freedom, every person can obtain information held on file concerning him or herself and, if necessary, may demand rectification or deletion of this own information by contacting the marketing department.